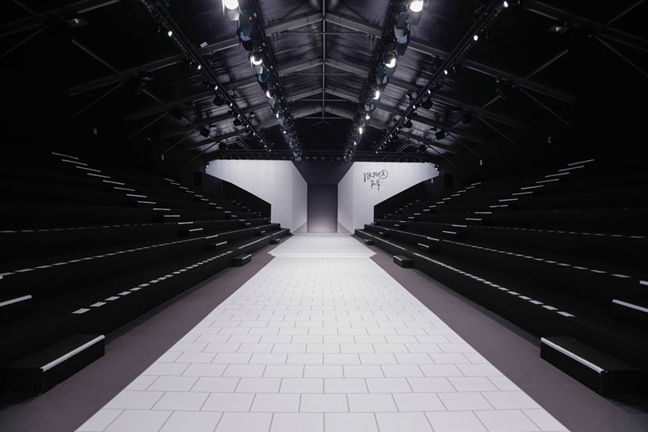 Continuing with the theme of “rebellion“, which they worked with earlier this year for Viktor & Rolf‘s A/W 2013 runway show at Paris fashion week, more on the side of sophistication in relation to the term than teenage revolt, Studio Job has once again collaborated with the dutch fashion duo on their latest catwalk set-up. 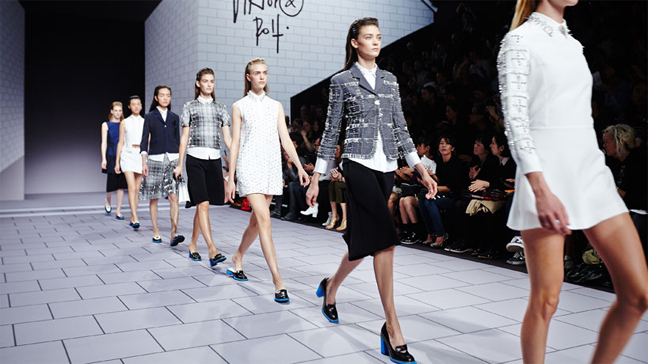 “The Wall” was the backdrop to Viktor & Rolf’s S/S 2014 collection: a composition of subway and square tiles, where the only thing keeping it from being completely stark white was a black graffiti tag of Viktor & Rolf’s signatures on the back wall. This idea of rebellious sophistication was emphasized by the atmosphere created by the indie artist Joan as Police Woman, who sang covers of Pink Floyd and Britney Spears.